Mindie’s story is a great tale for every aspiring entrepreneur. When I first talked with the French team, the startup wasn’t working on its viral music video app, but was working on something completely different called Ever. In only a few months, Mindie was able to abandon its storytelling app Ever, create another app, release it, get a bit of traction. And now it just closed a $1.2 million seed round from SV Angel and others — it even had to turn down investors. In the coming weeks, the team will also relocate to San Francisco. As a reminder, Mindie is a video-sharing app with a twist. When you record a video, you first pick a soundtrack and shoot a few seconds of video like you would on Vine. Then you share it on Twitter and Facebook. 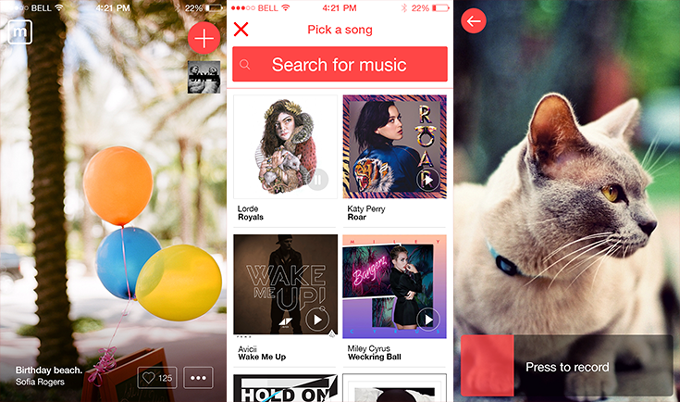 Music is the story of your video, it’s what makes the app so different from Vine, which became a comedy app. Investors include SV Angel, Lower Case Ventures, Betaworks, David Tisch, Dave Morin with Slow Ventures, CrunchFund (disclosure: CrunchFund founder Michael Arrington previously founded TechCrunch), Pete Cashmore, Lady Gaga ex-manager Troy Carter, and Chris Howard. This is the story of how Mindie came to be. It was beautiful. But there were too taps due to a cumbersome hierarchy. You had to tap on a post to see its content, tap on the play button to launch the music, tap on a picture if you wanted to write a comment (and the comment was tied to this particular picture). You could like a story or individual pictures, leading to a lot confusion. In other words, it was a pretty app with a bad user experience. As Snapchat has taught mobile designers, making pretty things doesn’t matter if your app isn’t efficient at what it should do. In July, after months of hard work, the team was confident enough to ask for feedback. Co-founder Grégoire Henrion showed me the app, and I know that some French designers had a look as well. Around the same time, the team pitched to get accepted in Paris-based accelerator TheFamily. “I didn’t even understand what Ever was,” TheFamily co-founder Oussama Ammar very recently told me. But he chose to let the company in the accelerator, thinking that it will have to change its product at some point or work on other projects with other teams. 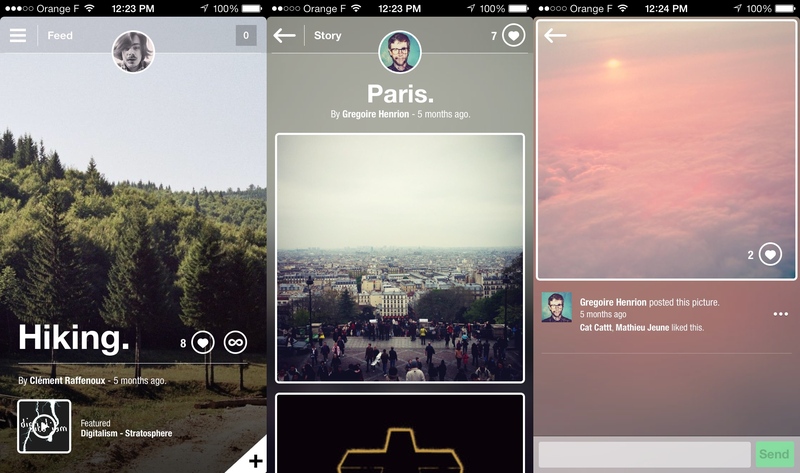 It was a talented team after all — it was able to make a good-looking app, all flaws aside. Something had to be done if the company wanted to avoid a scenario à la Checkthis – Checkthis’ story is very similar. The team realized that they had to start something new because Checkthis wouldn’t get traction. In fact, it had two weeks left to live when the startup released Frontback, its much more successful next act. It was the same for Ever and Mindie. Bouncing back is not always easy, but it’s exactly what the Mindie team did. At this point, the team showed everyone its main quality: listening to feedback. While everybody around the four of them was probably saying the same thing, it’s hard to have a critical opinion on your own work, especially if you’ve spent months on it. After refocusing and rethinking what Ever was all about, the team quietly worked on Mindie. In October, Henrion came back to me and sent me a message out of the blue. Mindie was ready for App Store prime time. When I opened the app, the first video of my feed instantly started playing. It was a very immersive fullscreen video with a soundtrack. When you swiped your finger across the screen, you got another video, another song. And it went on and on. Posting a video took a matter of seconds. Mindie’s launch wasn’t a big splash — I wrote a TechCrunch post, and that’s about it. Yet, slowly but surely, angel investors and product guys in the Valley started using the app. Jack Dorsey tried it and kept posting Mindie videos. But when the company started taking meetings in France to raise a seed round, a lot of investors said no. Mindie was a moonshot — it could either fail miserably or become incredibly successful. And French investors weren’t convinced. The team flew to the U.S. and spent four weeks in New York and San Francisco. It met SV Angel, who immediately invested and started putting together a seed round with business angels. It became clear that Mindie had to say no to many investors. Even though many French investors changed their minds, the round was quickly overbooked. Mindie’s trials and tribulations show that it doesn’t always go as planned, but it can thrive. A consumer product like Mindie resonates in San Francisco. This is where it can find its audience of early-adopters, investors that understand the product, and many product-savvy people. That’s why the Mindie gang will move to San Francisco in the coming weeks. The team is hard at work on a new version that will bring new creative possibilities. In the long run, Mindie wants to become the new MTV for the mobile generation. Remember that time when MTV was all about music videos, most of them amateur-looking but very creative? This is Mindie’s future. Mindie’s first app Ever wasn’t even released in the App Store. This is now all part of the company’s backstory. The road to creating an App Store success is long and winding. But when you struggle and listen to feedback, you eventually know when you have something compelling in your hand.